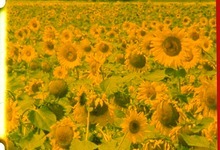 Structured in the camera by adjusting the focus frame by frame according to a series of patterns on particular plants situated in different areas of several contiguous sunflower fields, Sunflowers tries to make the whole spatio-temporal representation gain a certain stability, while keeping the graphic elements of the image mobile. The small cluster of frames, filmed one after the other, overlap each other on the screen to form various configurations. Filmed near Bédarrides, Vaucluse. 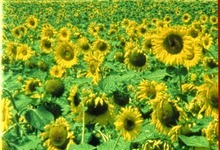 Les tournesols colorés is a capricious version of the film.